The Genan end-of-life tyre recycling concept is unique. The technology was originally conceived in 1990 and has undergone continuous development ever since. Our highly technological process has been developed and optimised through practical experience over more than 25 years. All kinds of end-of-life tyres, be they from passenger cars, vans, trucks, tractors or large earth-moving machines, are separated into their original elements: rubber, steel and textile. The technology is completely automated, ensuring a consistent and high quality product. Other suppliers of recycled rubber are found in the marketplace, but none are able to manufacture a product as uniform, clean and consistent as Genan. The output from a Genan plant consists of 75% rubber powder and granulate, 15% steel and 10% textile fibres. At the Genan plant in Viborg, a production line for very fine cryogenic rubber powder and devulcanised rubber is now in operation. These sophisticated products may substitute virgin material in numerous different high-end applications. One example is the tyre industry, thus resulting in cradle-to-cradle recycling. The Genan granulation process is a fully automated process – and thus not labour-intensive. A 70,000 tonne plant is run by only 3 staff members supervising the process – and 1 maintenance operative per shift. 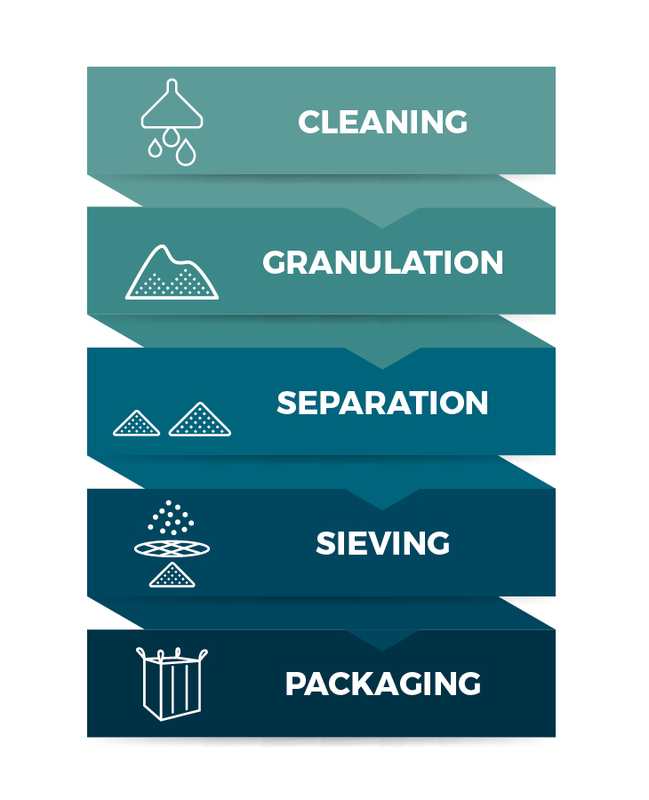 The Genan granulation process is certified for both energy and quality. Quality samples are thus extracted and analysed by either internal or external laboratories on a daily basis. This ensures that products meet the highest standards in the market – as set by Genan. The technical architecture which underlies the current process configuration dates back to the 1990s. It is continuously developed with strong focus on topics such as energy reduction, optimisation of through-put, purification of output fractions and reduction of maintenance costs. The total granulation capacity of all Genan plants is 375,000 tonnes per annum. Genan has produced rubber powder since the 1990s, and this vast production experience forms the basis for the two newly built production lines now in operation in Viborg: a cryogenic milling line and a devulcanisation line. Only material from the Genan granulation process is used as feedstock for the cryogenic production of fine rubber powder. This guarantee for a uniform, high-quality input ensures a homogeneous output of very fine rubber powder. 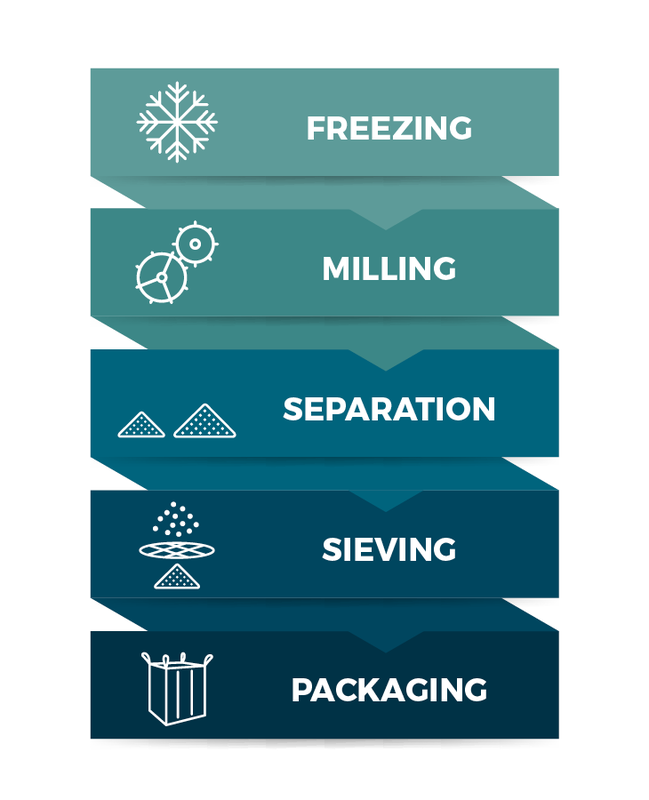 The production line for cryogenic milling is state-of-the-art technology. In the design phase, many resources were used to minimise energy consumption and to make the process as environment-friendly as possible. Two parallel, fully automated cryogenic mills process feedstock, providing a uniform output of very fine rubber particles. The total capacity of Genan’s cryogenic mill line is 22,500 tonnes per annum.